This sepia colored photograph shows a group of settlers know as "boomers" who were crossing into the Indian Territory of Oklahoma from Kansas. 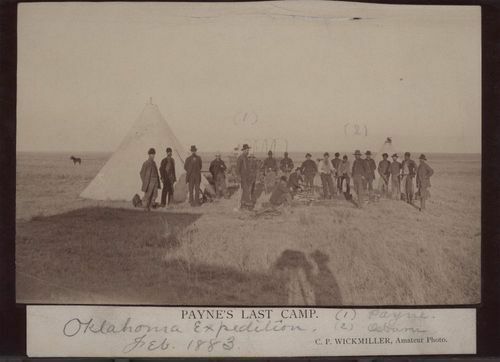 The group lead by David L. Payne were attempting to claim land for settlement that had not been assigned to Indian tribes. Their efforts were not successful when the settlers were arrested by U.S.troops and escorted back to the Kansas border and released. The land that the "boomers" were attempting to settle had been set aside for Native Americans tribes after they had been removed from ancestral lands elsewhere in the U.S. Therefore, the U.S. Government's actions to prevent the "boomers" from moving onto Native American land helped preserve what little land remained for the nation's indigenous population. Creator: Wickmiller, C.P. & Osburn, W.H.